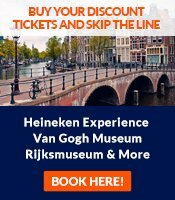 If you're looking for cheap tickets to Amsterdam, always check the rates of the airlines below. They are either are either no-frills carriers or have a special connection to Amsterdam, so they offer the most discount flights to Amsterdam. Also have a look at our other tips for finding cheap flights to Amsterdam. As a full-service airline, Dutch KLM isn't a low-cost carrier, but since Amsterdam is it's home base, it regularly has quite competitive rates. KLM maintains hundreds of connections to Amsterdam from all of the five continents. Dutch low-cost carrier MartinAir maintains direct flights to Amsterdam from Miami (USA), Mexico and several Caribbean destinations. The other Dutch low-cost carrier, Transavia, has cheap tickets to Amsterdam from especially southern European cities, but also Berlin and Innsbruck. However, you can also fly with Transavia to other Dutch cities (Rotterdam, Eindhoven and Groningen), and then catch a train to Amsterdam. Dutch trains are very efficient and reasonably priced. All in all, Transavia covers many West-, South- and Central-European countries this way. BE has cheap tickets to Amsterdam from many UK regional airports and Ireland. BMIbaby, the low-cost version of BMI, has cheap tickets to Amsterdam from some UK regional airports, but less than British European. The low-cost carrier RyanAir flies to Eindhoven in the Netherlands from many European destinations, among them London, Bristol, Dublin, Stockholm, Marseille and several airports in Spain and Italy. From Eindhoven, you can take the train (90 mins.) to Amsterdam. A lost-cost carrier specializing in cheap flights from Amsterdam to Morocco, Tunesia, Greece, Egypt and Turkey. You can book both vacation packages, or air tickets only with them. This excellent Slovakian low-cost carrier sadly went bankrupt in September 2009. Please note that airlines often change their schedules and prices, so take this information as a starting point for your own search after discount flights to Amsterdam. If you spot any information that isn't correct, we would be grateful for a quick note.